History says that body language has been existent since times unknown, however not many have considered it to be a basis of forming an impression or deducing some hidden meaning out of it. It’s been since the 20th century that researches were started upon determining the actual meaning of them. When you are in face to face conversation with someone, it’s your body that does the actual talk and your words only do a fraction of it. Surprised, we will tell you just how your body language tells more about you than your mouth! Let’s say you are scheduled to go for an interview. You of course would have planned and prepared really well for every question that you expect to be put forth you. But when you actually go for the interview you are being assessed on everything, right from the way how you dress, you sit, walk, how you hold your document holder, smile, and even talk. The interviewer will also be assessing you based upon your confidence level, if you make eye connection or not, how fast or slowly you speak and how much optimistic you sound about a number of things. So you must have noticed, while your preparation only lasted for good 5-10 minutes while you were being interviewed, your body was talking with the interviewer right from the time he put his eyes on you. Alternatively you might be going to see a girl for marriage, or may be meeting a teacher with your project, or might be giving a presentation to your team, or more. The scenarios could be many, but in all of these, your body language does more of the talking than your mouth. We know it’s not easy to understand and implement everything on you just like that, but that’s why we are here! Business is all about first impressions and ongoing interactions. Employee’s appearance, attitude and behaviour are direct reflections of your company and your brand.Why do some people seem to move quickly up the Corporate ladder while others with equal qualifications get left behind....? It is all about employees conveying a strong professional presence while being approachable.Organizations that endeavour to be on the path of continuous learning will often find that upgrading the 'soft skills' of their workforce is a necessary part of business.Many organizations we have worked with point out that soft skills are high in the list of requirements for global business, hence an important part of training. They have found that soft skills such as Business Etiquette, Cross Cultural Sensitization, Power Dressing, Dining Etiquette, Image Enhancement and good Communication Skills, Telephone Etiquette, Email Etiquette, Body Language makes a greater impact on clients from across the world rather than a high degree of technical skills.Without a strong professional presence your employees cannot be effective negotiators or managers that confidently represent your Company to higher levels of profit and productivity. Discover how Business Etiquette Training and Image Consulting can groom Employees who are ready for the next level.Our workshops will help the employees to learn the hidden value and priceless potential of Image, Etiquette and Protocol. This would tremendously help them to make a difference in business.Our modules are designed to be extremely interactive and practice Oriented. We believe in learning by doing. 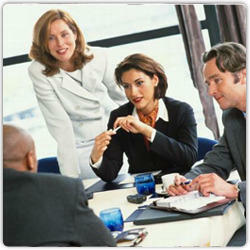 We strongly recommend training formats that include role plays and a participative teaching style. We can customise the program to suit your Organisation’s specific needs.